Firstly, thanks to all of you who had a go (or just took a look) at my recent puzzle pic. 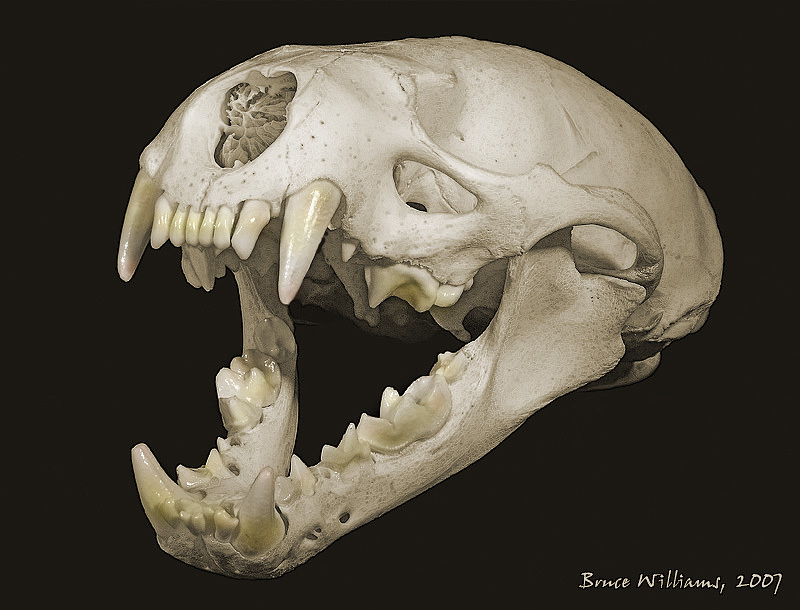 The answer (sussed by Rik) was "an otter's nasal concha" and here's the skull of the unfortunate young otter that featured in the competition. I had problems photographing this skull - mainly because it had been professionally cleaned and sanitised. This produced a very sterile bone and tooth colouring which (coupled with the fact that it was a very young individual) resulted in a rather characterless appearance. As photographers we are often torn between producing an accurate reproduction of our subject and a result that is pleasingly artistic. So, that sets up my excuse for pic3 which is unashamedly self-indulgent (that doesn't mean I think it's good just that it's not an accurate representation of reality ). The teeth were a problem in that new adult teeth were in some instances pushing out the milk teeth. In the end I decided to remove the milk teeth and expose the emerging permanent teeth. Pic1 is taken from the back of the skull looking under the Occipital Bone and through the Foramen Magnum - giving an unusual view of the ornate nasal concha. I manually merged 2 separate stacks for this image. The first set (16 frames) exposed for the whole skull and the second set (4 frames) exposed for the (darker) nasal concha inside the skull. Pic2 is a RH 3/4 view. I decided to "enhance" the colour of the teeth (ok mayby a bit over-the top ) and partially desaturate the image. My excuse for "playing" with the last 2 images is my general dissatisfaction with the clinical appearance of the skull. Pic3 is my "arty" LH 3/4 view (greatly exagerated bone texture and teeth colouring). I'd be interested in opinions as to the acceptability of this sort of treatment for posting on this forum . Any digital enhancements that alter the "naturalness" of the subject must be declared in the image post. Any image that has had digital enhancements that deviate a considerable amount beyond reality should be so noted in the post. It sounds to me like you've declared the enhancements well enough that a reader ought to catch on, so as far as I can see you're completely within the guidelines. It is an interesting gray area, though. Some of our members have posted images that are outrageously modified -- altered so much that no reasonable person would mistake them for reality. No problem there. But pics #2 and #3 posted here are potentially misleading. In fact my first reaction (before reading the text carefully) was to think "Wow, how did he light that skull to show off so much texture?! And why is there that much texture in the first place? Where did this skull come from? Has it been weathered or etched or something? How old is this thing?" But on more careful reading -- and comparing against the distinctly more clinical pic #1, I think that what I'm seeing is largely the result of some very strong sharpening, artfully applied to produce not a trace of recognizable artifact. I really like pic #3, and (as with some of your earlier photos), I think it looks like a classic textbook illustration. The shape of the structures is modeled beautifully, and the difference in texture makes completely clear what is tooth and what is bone. Are these enhanced pics "acceptable"? Absolutely! But thanks for calling our attention to what's been done to them. Danny is BIG on digital creations, and has posted a few here in the past. I'm pleased that you posted these, but I do think it is appropriate that you declared them, especially since 2 and 3 are realistic enough to be taken as straight "reality photos". Thanks for clarifying the position Rik and thanks to all of you for your generous and encouraging words. Doug - the large hole below the second premolar is probably what in humans is called the mental foramen . The hole allows nerves to pass from the inside of the jaw to (amongst other things) the lower lip. ...but I suspect it's that curious "double hole" just behind the canine that caught your attention. Hmmm... dunno? could be as you suggest for muscle attachment or possibly the transit of blood vessels through the jaw bone - or it could be the mental foramen in which case what's the other hole for ? 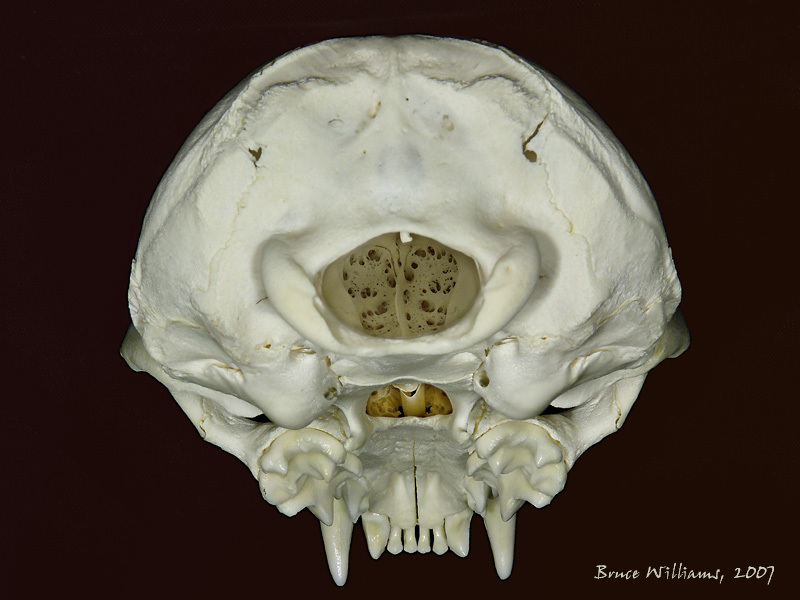 Reminds me of the zygomatic arch on a human skull, which I believes allows tendons and things to hook onto the jaw. I believe what Doug might be asking about are the large holes that appear to penetrate the lower portion of each eye socket wall. I teach Human Anatomy and Physiology for nursing students in the evenings so I have some familiarity with skulls. 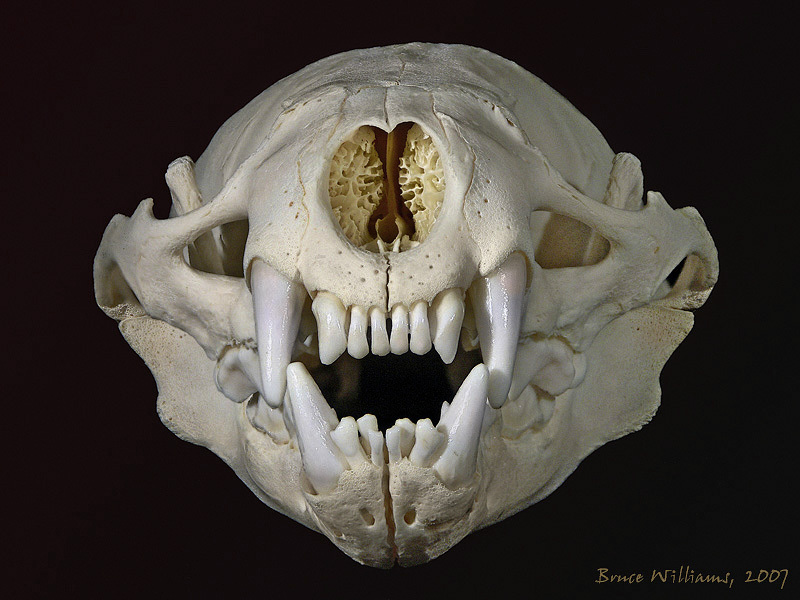 Those holes are analogous to the infraorbital foramen (literally the "hole below the eye orbit") in the human skull and are called the same in the otter. In the human the one eighth inch diameter infraorbital foramen carries sensory and motor nerves to the surface of the face. So we can feel a slap and grimace when it happens. In the otter that same portal is infinitely more important. It carries sensory and motor nerves to the vibrassae which are the highly sensitive whiskers and associated erector pili muscles on the otter's face. The otter can detect faint vibrations of a fleeing fish and probe the ocean or river bed through an opaque fog of silt to produce a base relief almost image-like sense of prey hiding there. There's even evidence that there is cross-talk between these facial nerves and the optic nerves. So it's not surprising the nerve bundle is a massive one, hence the large "hole". Bruce, those photos are superb. Bones are not easily photographed because of mostly featureless and monochromatic surfaces. I'm trying a project to produce web based 3D interactive bones with photographic textures but have never been able to achieve the revealing texture you have here. If you're interested in this let me know and I'll send you some sample files. Thanks for a most interesting post and for your generous and encouraging comments on my photographs. Your 3D project sounds fascinating and most certainly I would be very interested to see some sample files. Sorry for my delay as well. I sent you some zipped files via email. I had to use your website email as I didn't see a way to attached zip files to the pm from the forum. The files depict an interactive human scapula or shoulder blade.